I think this is kind of a fitting nail varnish to show on Halloween. 🙂 It’s Illamasqua Hemlock from their Freak Collection! This is the only nail shade in the Freak Collection and it’s limited edition. 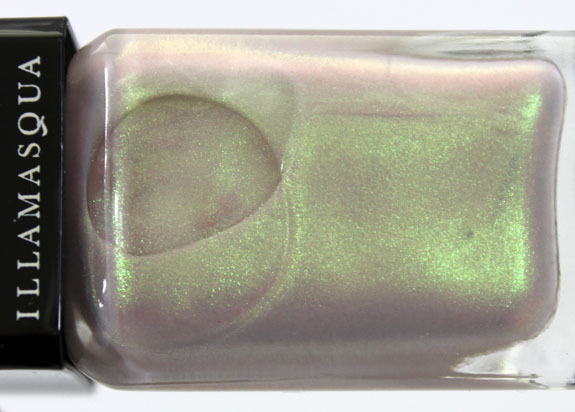 The color of Hemlock reminds me of an opal ring I once had when I was in my teens. 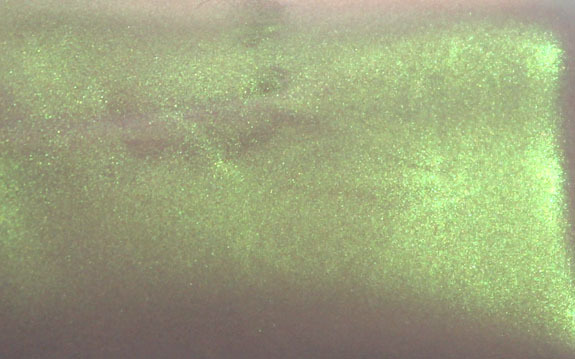 The color is a beautiful green iridescent that changes depending on the lighting. It’s great for layering as well. Hemlock on it’s own just gives you a somewhat sheer wash of the opal green color. The green is a very yellow-green color. The formula is great, just on the thinner, more sheer side. I used two coats here. The green really comes to life when you use it over a dark polish. It glows! Availability: This is limited edition and sold on Illamasqua’s website. What do you think about Hemlock? New Sephora by OPI Nail Polish Colors! I like the way this polish looks, but for some reason when layered, it appears a bit streaky to me. I am giggling a lot as I did exactly the same thing – wear it alone then layer it over Scorn! My photos sucked though so I am waiting to get the time to do it again. Looks gorgeous on you. So shimmery and opalescent. It somehow reminds me of Nubar Magic Potion, which I love to use for layerings. Wow, that is gorgeous! It looks really great against your skin, which means that it probably won’t look so good against mine. 😛 I hope this comes to Sephora so I can test it out for myself. I really like this one and I love the name! I like how it seems to glow when layered. 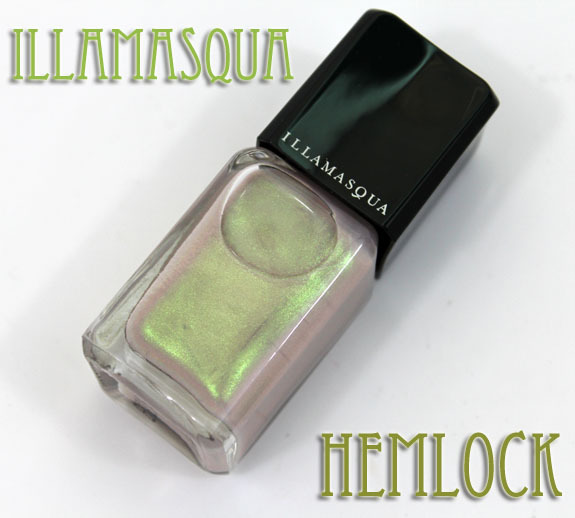 I may pick it up – I need to get some Illamasqua, but could never decide what to get. I’m waiting on mine still! I love it, and it looks great alone and over Scorn! It does remind me of some other polish though… I can’t come up with the name though. Looks great on you! Carmela´s last post…Color Club Revvvolution = Happy Holo-ween! I was thinking the same thing…I’m sure there are plenty of dupes out there that are cheaper, so I think I’ll pass. I like it, but I can’t bring myself to spend that much money on a polish that I would only ever use for layering. I have to put Hemlock on my wishlist right now! I love this polish! Oh wow, I really need to get this! Over Scorn it looks like a beetle shell. Beautiful! Wow, this is gorgeous! I love it alone or over dark! Love it! Have it on order 🙂 SO very pretty–lots of cool combos to try! ManicuredSlayer´s last post…SlayerStyle: Spooky Nails! Love this over the black. An amazing polish. 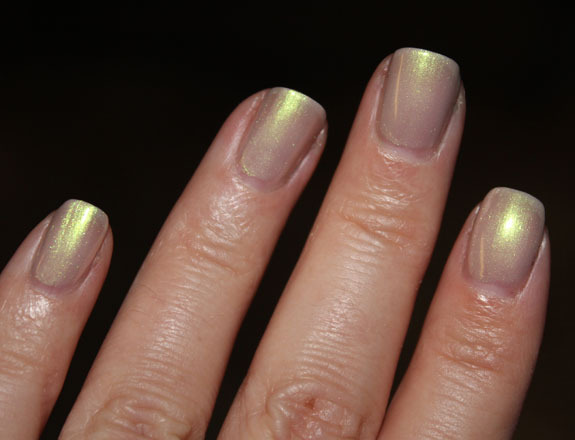 This reminds me of something like OPI Electric Eel when layered. It’s ok, but I have so many layering polishes that I never, ever use so I feel no need to get this. It will only take up space. You have such nice nails! i was so excited when you tweeted about this nail polish! but now im bummed..i still like it but since im dark idk if it will look good on me :/ hmmmm!!!!!!!! to buy or not to buy .. hmmm… decisions! OPI Fireflies sooooo much better than this one. You can build the color. I like it on my fair hands.